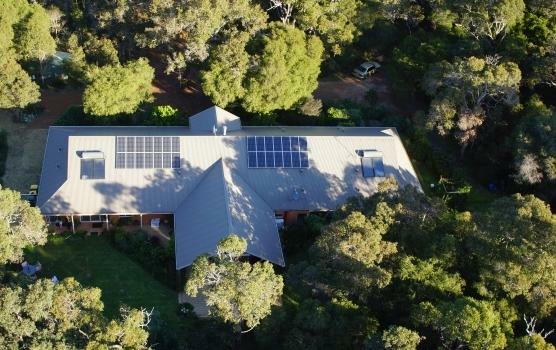 For the best Margaret River Guesthouse Accommodation in a grand, luxurious but eco-friendly style, the Margaret River B&B is a top rated hotel on Trivago and a top rated B&B/Guesthouse on Tripadvisor. 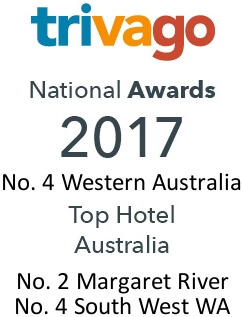 Awarded 2015 Tripadvisor Hall of Fame and Tripadvisor Certificate of Excellence 2016 and 2017. Here you will find your own guest lounge to relax in. You can have a complimentary glass of wine on arrival and help yourself to coffee, muffins and Allsorts anytime. A double spa-bath in every room. Views of the forest and beautiful gardens from every room to look out on from your own private veranda. Do you want ease of booking without paying a deposit and a sensible cancellation policy? Do you want to stay for one night or as long as you need? Would you like a special package? If this is what you want, you need to book with us now. Accommodation at the Margaret River B&B at Loaring Place is a relaxing and peaceful BnB holiday experience, centrally located just minutes from Margaret River's renowned restaurants, pubs, and shops in the heart of the Margaret River Wine Region. 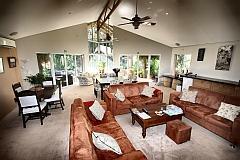 Set deep within a beautiful south west forest, the alluring bush surrounds us. Enjoy the tranquil atmosphere, warm hospitality, hearty breakfasts and knowledgeable advice from your friendly hosts. 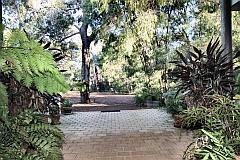 This Margaret River Guesthouse is conveniently located 5 minutes from Margaret River's famous beaches, sensational surf, world class wineries plus fascinating caves, historical light houses, giant karri forests and other fabulous attractions all close by including the Margaret River Golf Course with its kangaroos, Eagle Heritage and the Amazin maze. We are also happy to arrange a shuttle service so you can enjoy lunch or dinner and book wine tours. 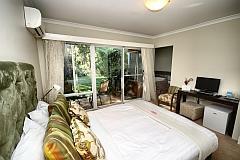 Our resort style accommodation has four spacious contemporary rooms each with a double spa/jacuzzi and en-suite. The purpose-built single level building provides luxury accommodation with all the creature comforts that you desire. Full use of a large guest lounge or enjoy the intimacy of your own private verandah. Our mission is for you to relax, rejuvenate, be happy and have a most memorable stay. 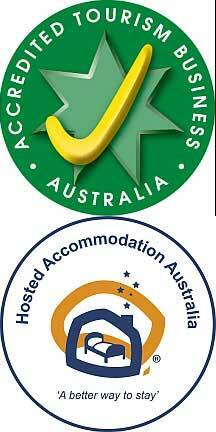 Please contact us if you have any queries about our AAA rated 4.5 Star facilities or any special requirements. You can also book an all day scenic nature and wine tour including a scrumptious lunch. You will discover some of the most scenic locations in the Margaret River Wine Region with the rocks, soils, landscapes and plants explained and then taste some of the wines and other produce of the region. A family friendly tour for everyone that enjoys taking photos and tastings. Check availability here for accommodation and tours and book online now with immediate confirmation. Special Nature Tour Deals if you are staying at the Margaret River B&B and booked direct on www.margaretriverbnb.com: Stay at the B&B for 2 nights and get a 15% discount off the tour. Stay 3 Nights and get a 20% discount. Stay 4 nights and get a 25% discount. Stay 6 nights and get a 30% discount off the tour. If you are staying at the Margaret River B&B but have booked through a travel agent or online travel agent, the same discounts apply less 5%. Subject to availability. Conditions apply. Please request the discount in the COMMENTS BOX when making a booking. More details at www.margaretrivernaturetours.com.au or call 1800024649 to enquire and make a booking. A delicious home style lunch and dinner can be prepared for you on request - and we can also create cheap great value hamper snacks and lunches for you to take when exploring the bush! BBQ area and deck set within the forest so you can create your own barbeque sizzle. To thoroughly enjoy yourselves when you go out to a restaurant and not have to worry about the driving, let a driver take you to your restaurant (or wineries) of choice and bring you back to Loaring Place when you are ready, in your own car. The walls of our huge lounge and the hotel's hall space display paintings from Western Australian artists. Want to bring home a little piece of the magic of your Margaret River accommodation retreat? All the art work can be viewed and purchased and we can even arrange to post it to your address. You'll be bringing the peace and magic home with you, and also helping support Western Australian and Margaret River local artists. Members of the public are welcome to inspect the art works from 10:30 am to 5:00 pm (open every day unless B&B holiday houses are closed). Tea, coffee and muffins are available for purchase and enjoy in our lounge or alfresco area. Check in the blog area for current artists and pieces on display. The Margaret River B&B holiday house accommodation at 15 Loaring Place is the most relaxing, serene slice of the real Australia that you'll find at our holiday cottage accommodation. Down-to-earth, delicious cooking ... nothing to hear but the crash of surf 4km away and peaceful bush sounds at night time ... genuine resort hospitality and inspirational artwork. Book your Margaret River boutique hotel stay today or call for special, corporate or last minute deals ..... then your only problem will be leaving! Check availability here and book online now with immediate confirmation. Special Nature and Wine Tour Deals. Stay 4 nights and get a full day Nature Tour for free* or grab a Two Night* tour special including a bottle of sparkling wine on arrival and a full day nature and wine tour including a scrumptious lunch (Tours subject to availability). Book here *Twin share 2 night minimum. 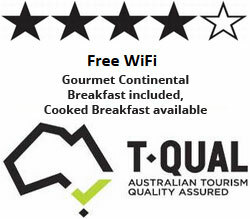 Stay 4 nights at normal tariff and get the tour for free. Please call to book. Conditions apply. 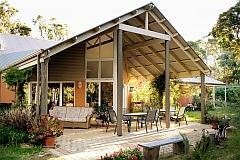 The Margaret River B&B holiday house accommodation at 15 Loaring Place is the most relaxing, serene slice of the real Australia that you'll find at our holiday cottage accommodation. Down-to-earth, delicious cooking ... nothing to hear but the crash of surf and peaceful bush sounds at night time ... genuine resort hospitality and inspirational artwork.